So, you have decided to reset the Dragon Ball Legends game progress or you don’t know how to save or restore old saved progress. In this post, we have covered everything in detail; how to reset, data transfer, start a new game from the beginning. Let’s start without wasting time. In Dragon Ball Legends, you can link the game to your Facebook or Twitter account to save game progress. Linking the game to these social media accounts reward you free 500 crystals. And you will be able to start from where you left off anytime on any device. Step 1.) Open the game. Tap on the menu. Find “other” option and tap on it. Step 2.) In other settings, tap on “data transfer settings” option. Step 3.) Now, choose a method; if you want to link the game to Facebook, then tap on Facebook account. Then a new pop-up Facebook Sign-in window will be open, enter your Facebook username or phone number or email and password. Then choose to continue. If you want to link the DB legends to the Twitter account, tap on “Twitter account” option. Enter your twitter username and password and authorize the game to your Twitter account. You can choose anyone. Once you link it to one of these Social Media accounts, back to the menu -> tap on the mission option -> head to Z mission and claim free 500 crystals. 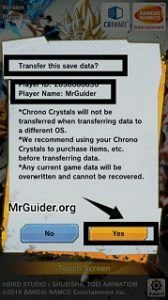 Go to your mobile settings -> apps -> Dragon Ball Legends -> clear data. After it, open the game again. Choose the language. After it, you will be asked to start a new game or transfer old data. Choose to start a new game. And that’s it. Case 1.) When you start the game, you will be asked to “start a new game” or “transfer” old game progress. Choose transfer -> sign-in with your Facebook or Twitter account. That’s it. Case 2.) If you are playing the game as a guest; go to menu -> other settings -> data transfer settings -> link the game again to your Facebook or Twitter account(which was used by you earlier). For instance; I have only one social media account and I want to use it to save game progress. But it’s linked to the game and I want to reset it and start a new game and then I want to use it again to save game progress. For this, you have to go to Facebook or Twitter Settings -> choose apps -> search for Dragon Ball Legends -> remove it or unauthorize it from Facebook and Twitter account respectively. Once done, clear the data of the game. Open the game, choose “start a new game”. Go to menu -> other settings -> link the game to your account and it will not reload your past progress and you can play DB legends from the beginning. 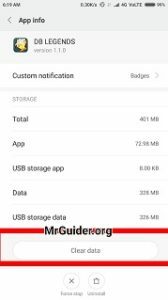 Keep note that; If you are transferring the data to different OS[i.e. From Android to iOS], you will lose your crystals. 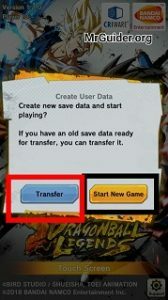 So, this is the brief guide for Dragon Ball Legends game players who don’t know how to save progress, restore old progress, how to start a new game. You can ask more questions here.